Security cameras rarely send the message you're in a safe area. Their presence usually more likely mean you're somewhere someone expects something to go wrong. 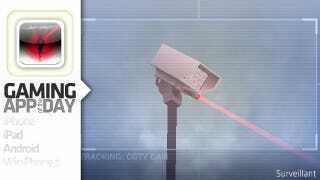 Surveillant expands on this sense of menace, making the camera an adversary, not a friend. Surveillant, for the iPhone and iPod Touch, is a sleek 3D platformer that offers some rewarding gameplay even for being in its 0.2 version. It's still $1.99 on the iTunes App Store - not the best bang-for-buck value considering you get just 10 levels right now. But the levels are not speedrun-simple even though your instinct is to rush through them. In the game, you must navigate the minimalist geometric environment to the top of a security camera's pedestal, where you deactivate the camera. A laser beam mounted to the camera provides extra incentive to stay out of its sight. Though you can dash away and take cover, you won't last too long once it locks on and starts roasting away. Surveillant uses the iPhone/iPod Touch's accelerometer to pan the camera left or right. Movement is handled by simply touching where you want to travel. You may move anywhere regardless of distance, but your elevation will only change if you can see the surface of the platform you're trying to hit. The second control is a camera button in the upper right, which centers your view on the camera and where its laser is currently aiming. Patience will reward a successful climb up to the camera's perch. When you fail in Surveillant, it's usually because you didn't use your one advantage over the camera - the ability to always see it, when it cannot always see you. I'll confess some frustration with the controls at first. If you're on a ledge and the top of the next pillar is just barely a sliver to your view, you might find yourself wildly tapping on a part of the screen that doesn't register. This can make for some panicked scrambles as the laser's noise buzzes ever louder nearby. Another problem is imprecisely tapping a point well into the distance, which means you miss your pedestal and end up drifting to the ground. While it means you may move anywhere with a touch, it does introduce some hazard the further away you're aiming. On the whole, Surveillant is, even in a pre 1.0 release, a difficult platformer with a great deal of potential. The $2 price might be a bit much for some given that only 10 levels are included. Still, much of the game experience is tied into planning, observation and considerate movement, rather than the swift completion of a jumping puzzle. Early adopters will be those who can appreciate a thoughtful challenge.